I’ve been doing a lot of cooking lately and didn’t feel like preparing a complicated time consuming dinner. 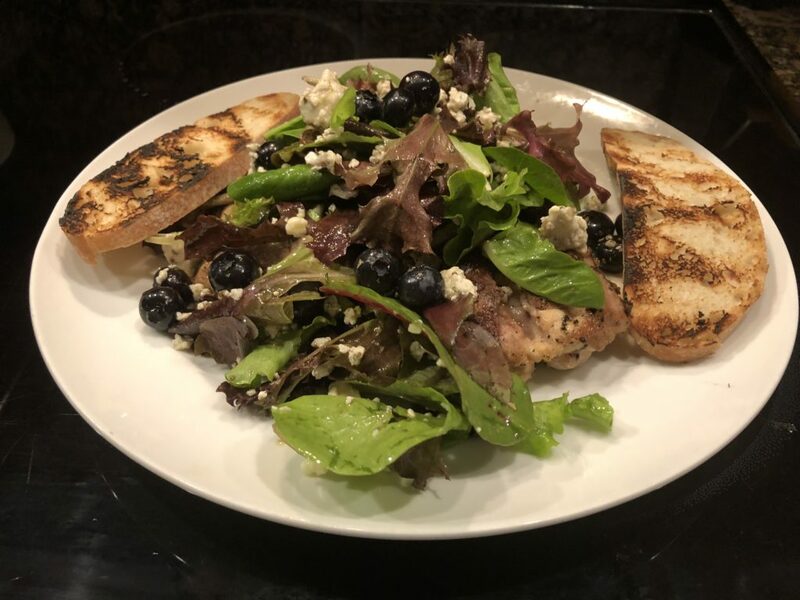 So, I went to an old favorite…grilled chicken thighs over a bed of tossed organic spring mix greens, fresh blueberries, Sargento crumbled blue cheese, and Pompeian red wine vinegar. The Blueberries and organic spring mix were on sale this week at Publix, so I had everything on hand. Everyone who lives in Florida from the Northeast is well aware of Wegmans grocery store. I originally found this recipe at Wegmans at least 30 years ago. The salad was light and refreshing and our whole family enjoyed it since we are all blue cheese & blueberry fans. To give the salad a twist, I pulled out my 12″ nonstick Calphalon grill pan and grilled my chicken cutlet to perfection right on the stove with Colavita virgin olive oil and Pam Non-Stick Cooking Spray. The dish was a huge hit! 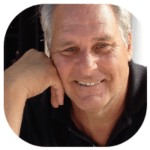 I’ve since served the salad over grilled boneless chicken thighs for a more healthy version. Besides, chicken thighs are more moist. To Prepare Dressing: In a small bowl combine red wine vinegar, fresh lemon juice, dried basil, sugar & freshly ground pepper. Whisk until sugar is dissolved. Slowly drizzle in the olive oil, whisking constantly until the dressing emulsifies. Heat grill to medium-high. To prepare the chicken for grilling, place it on a platter to transport it to the grill, Then, spray the chicken thighs with Pam and add salt and pepper to taste. Grill the chicken thighs for 5 to 7 minutes on each side, or until your True-Temp Instant-Read thermometer indicates 165 degrees. While chicken is grilling, in a large salad bowl, toss the spring mix, blueberries, blue cheese and dressing. Place 2 chicken thighs on each serving plate and top with tossed salad. Serve! PLEASE NOTE – Before returning cooked chicken to the platter, make sure it is thoroughly washed with hot soapy water. If you’re looking for a easy to prepare, light, healthy dinner choice this is it! Grilled Chicken Thighs with Fresh Blueberries and Blue Cheese over a bed of Organic Mixed Greens. Fabulous!